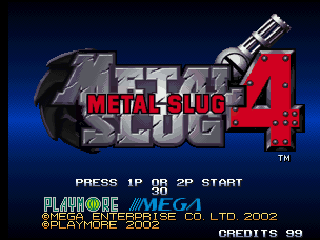 Metal Slug 4 (メタルスラッグ4) is a run and gun video game for the Neo-Geo console/arcade platform created by SNK. It was released in 2002 for the MVS arcade platform and the AES game console, and is the fourth game in the Metal Slug series. Two years later, Playmore published Metal Slug 4. This was also the only Metal Slug game that was produced during SNK's bankruptcy, until its sequel was released after SNK was "resurrected" as SNK Playmore. Metal Slug 4 retains the same gameplay as previous titles, with the addition of some new enemies, bosses, weapons, several new vehicles and a new bonus combo system. It was later ported to Microsoft Xbox (not compatible with Xbox 360) and Sony PlayStation 2 as a stand-alone game in Japan and Europe, and along with Metal Slug 5 as a compilation in North America and South Korea.